Video tutorial courtesy of Jeff Lofting. 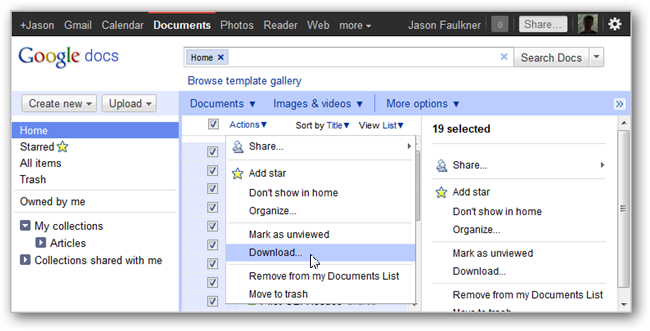 If you make use of Google Docs, you can easily download selected or all documents at once. If you want only certain documents, pick the ones you want. Once ready, under the Actions menu, select Download. 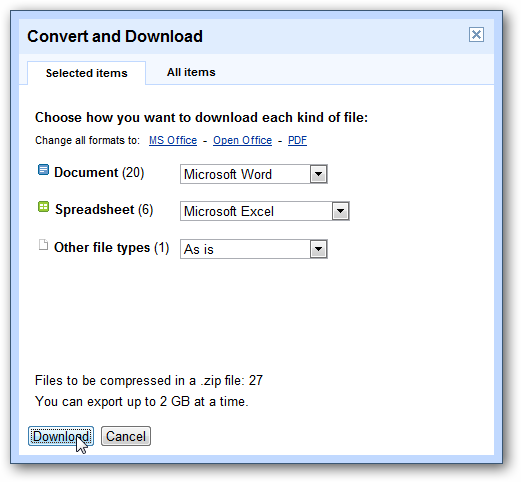 You will have some options with the format you want to download certain documents types in. For the most part the default settings will do but you can customize to fit your needs. Click the Download button once you are ready. Save the resulting zip file to your hard drive. 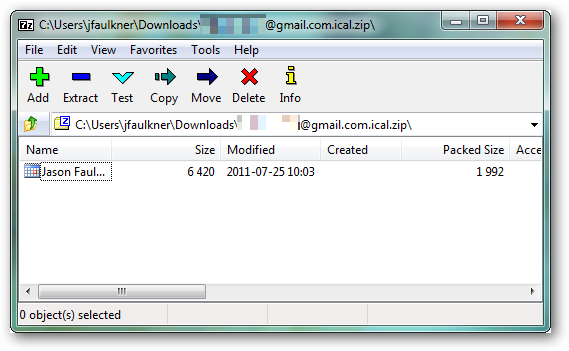 When you open the zip file, the documents are in the format and folder structure used in Google Docs. Tutorial courtesy of Rick Freeborn. To print this document, click here. To print this document, click here. Adapted from Rick Freeborn's Google Forms Backup and Restore Tutorial. To add items to your docs list, you have a few options. You can drag-and-drop your files directly from your computer into your Documents List, and even straight into a collection. This feature is available only in the latest versions of Chrome, Safari, and Firefox. If you aren’t working in the latest version of one of those browsers, you can click the Upload button and select Files from the drop-down menu. 1. In your Documents List, click the Upload button (up arrow beside the Create button) and select Files from the drop-down menu. 3. Your file will appear in your Documents List. If you utilize Google Calendars, you can easily export this information into ICAL format. 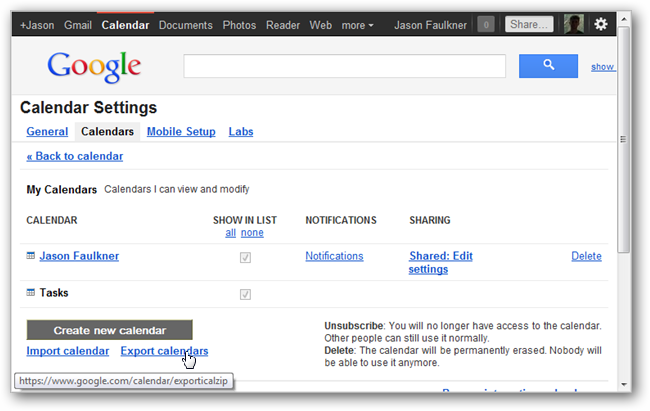 Once in your Google Calendar, click the gear icon in the upper right corner and select Calendar settings. Under the Calendars tab, click the Export calendars link. Save the resulting file to your hard drive. When you open the downloaded zip file, you will have an ICAL file for each Google Calendar. - Make sure to select their Permission Settings, according to what access you would like them to have to your calendar! Click Save, and you should be done! Repeat these steps for each calendar you would like to share.